So, as I watch the incredible advancements for self driving cars I can’t help but think about what this may mean for our kids. 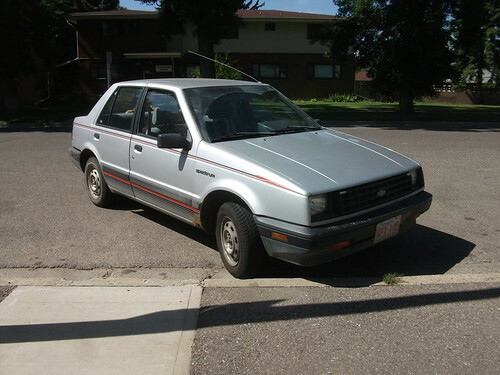 I remember my first car, a crappy Chevy Spectrum I got from my mom. I loved that car. Not because it was awesome, because it was NOT. It actually looked more like a refrigerator on wheels (see picture) but I loved it because of what it represented. It’s strange to think that our kids will not only not need a license, they probably won’t even care about getting one. What will it be like being a teenager when you can order a Self-Driving Uber from your Iphone (or maybe you can just yell “UBER!” and the closest drone will relay your request through the network). A robot car will take you on your first date or to your prom or on a road trip with your best friends to see your favorite band 2 cities away. I know it sounds crazy but things are definitely happening fast. Just last week a convoy of Self Driving trucks made their first multi country trip, China is plowing ahead as a challenge to the US and this guy found a way to build a self driving car in his garage (and wants to sell conversion kits for $1000!) . It might only be a matter of months, not years, before this is going to be a BIG part of our lives. It’s time that we really start thinking about how this is going to change the world in a major way. Where we live, where we work, how cities and highways will need to adapt, jobs that may be lost as the workforce needed for logistics and transportation drops to next to nothing. The impact can be mind boggling when you really get down to it. On the flip side, self driving cars could save millions of lives. MILLIONS…. Whatever your thoughts, there’s no denying it anymore. This is happening and happening now. I’ll forever be grateful to my crappy Chevy POS. The memories, social status and adventures, but nostalgia can be a strange thing. Easy to forget about high gas prices, insurance, breaking down on the side of the highway in the rain and just remember the good stuff. So I’m preparing myself for that conversation with my kids. How they’ll look at me when I talk about the good old days when cars couldn’t drive themselves. When I needed to take a test and get a license before I could use a car. Like I was some kind of jerk…..